"I owe it to myself to tell you of my life." All directors of even modest accomplishment have their partisans, and I know that Alain Resnais has his. I remain deeply skeptical about his body of work, though�even his most celebrated pictures, like Hiroshima mon amour, strike me as suffering from an exaggerated sense of their own importance, and Resnais never demonstrated the technical facility on display in the work of his nouvelle vague brethren Jean-Luc Godard and Fran�ois Truffaut. 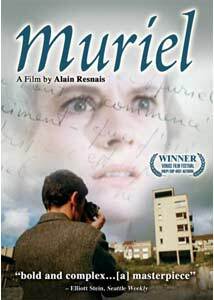 So about the most charitable thing I can say about Muriel is that it did not dissuade me from any of my previous conclusions about Resnais' films. In fact, it frequently exemplifies the solipsism and pretentiousness that are so frequently derided in the U.S.�no doubt the director is well intentioned and reasonably intelligent, but having to sit through this really is kind of unbearable. That's because it's essentially a movie of ancient recriminations, about events that took place long ago and far away�we're supposed to be struck by their continuing psychological resonance, I suppose, but they're never made alive for us, and the characters in the piece seem successively more unpleasant. Here's your central quartet: Delphine Seyrig plays H�l�ne, who lives in the sea town of Boulogne, and, now widowed, does her best to cobble together a living by selling antiques and other collectibles out of her apartment. Her late husband left her not only this handsome flat, but also a roommate of sorts�she shares the place with her stepson, Bernard (Jean-Baptiste Thi�rr�e), who has recently returned from the war in Algiers. He's mum not just about what it was like at the front, but about everything else. For reasons that remain essentially opaque, H�l�ne has recently contacted an old lover, and he's coming for a visit�Alphonse (Jean-Pierre K�rien) couldn't be more full of himself, and he too has logged time in Algiers, though as a caf� owner, not as a soldier. (He clearly fancies himself a sort of Rick Blaine, but no one is as impressed with him as he is with himself.) He travels with a companion, the lovely young Fran�oise (Nita Klein), ostensibly his niece, though if you believe that, I've got a bridge I'd like to sell you. There's no shortage of old grievances being aired, about how and why things went south decades ago between H�l�ne and Alphonse�what happened to you on that May evening before the war, when we were young and lovely? But it's never made palpable for us�it's like dropping in on old relatives feuding about who overcooked the turkey and burned the gravy on Thanksgiving in 1953. They love nursing their grudges and airing their dirty laundry, but really, there's almost no dramatic interest to this. Potentially more intriguing is Bernard, who clearly suffers from what would later be labeled post-traumatic stress disorder�but Resnais portrays him as little more than an overgrown, unruly teenager, all angsty and emo about the rules laid down by his wicked stepmother. The first portion of the film is dominated by a long dinner scene with the four of them, and you watch desperate for something to happen, or for at least some sort of emotional flare-up, but at some point you realize that the tedium is actually being cultivated, and you turn on the film and its director. If you've got the endurance or charitable disposition to hang in there, you won't be rewarded for your efforts. Check, please. Image Transfer Review: The colors have bled into one another and faded significantly with the years; the print really looks very poor, even compared to films of its period, and the transfer offers nothing to offset that. Audio Transfer Review: The audio problems aren't quite as glaring, especially if you're not a Francophone; but even if you're reading along with the subtitles exclusively, you'll notice a fair amount of crackling. Extras Review: Aside from trailers, the only extra is an interview (13m:47s) with Resnais biographer Fran�ois Thomas, discussing the director and issues of censorship, particularly with regard to the Algerian war. As you could probably predict, Thomas is more favorably disposed toward the film under discussion than is your humble dOc reviewer. Diehard Resnais fans may rejoice, but for the rest of us, this is a pretentious exercise in cultivated tedium.